4 Star Accommodation With 4 Bedrooms. (Sleeps 6). Ideal For Families + 2 Bathrooms. Dragon Cottage is a 4 star self-catering accommodation, situated in a relatively quiet Tenby street facing south, and therefore in a centrally sunny spot. It has 4 bedrooms and comfortably sleeps 6 people plus baby. It has recently been refurbished, yet retains many of its original features. Beautifully furnished & well equipped for self catering holidays, it benefits from a secure and private rear garden & patio. Dragon Cottage has a level access with 2 bathrooms (ground floor & 1st floor). Also single ground floor bedroom. The flooring in the kitchen and bathrooms are tiled. The Hall has a block wooden floor. All other areas are carpeted. Gas central heating, electricity, bed linen and wi-fi are provided without extra charge. •Lounge with colour TV / DVD; radio. •Kitchen/Dining area fully equipped with automatic washing machine; dishwasher; fridge-freezer; electric cooker and microwave. •Bedroom one with single bed. •Bathroom one with bath; bath shower; separate shower unit; toilet; wash basin; shaver point. •Boiler room with tumble drier. •Bedroom two with a single bed; circular marble wash hand basin. •Bedroom three with two single beds. •Bedroom four with double bed; wash hand basin. •Bathroom two with claw footed bath; toilet; wash hand basin; shaver point. High chairs, travel cots and towels are available, and if required should be reserved at time of booking. Duvets and bed linen are provided along with a welcome tray. The pillows are all non feather pillows and duvets have poly cotton covers. There is good lighting in all areas of the cottage with good colour contrast between walls and floors. There are three free parking spaces outside the Cottage which are available on a first come first served basis. There are also a limited number of free on street parking places in adjoining streets. There is a multi storey car park just around the corner in Upper Park Road, which is an adjacent street. A weekly ticket (£20) may be purchased in advance, which will grant you permission to park not only in the multi storey but at any long stay council car park in Pembrokeshire. As an alternative, a residential parking permit can be purchased for the same price which would allow you to park along Trafalgar Road. (A parking application form is provided at time of booking). The road outside the Cottage is relatively quiet and it is possible to easily on/off load. Dragon Cottage is within easy reach to all that Tenby has to offer, including the bowling green and putting, which are just up the road, and the golf club which is also nearby. Not only is Dragon Cottage ideally located for your self catering holidays in Tenby, it is also fully equipped with all that you might need to make your stay in the beautiful county of Pembrokeshire a memorable one. Nigel & Sian Davies are the owners of Dragon Cottage + we endeavour to offer a first class holiday experience to all who come to stay at our property. It is a very special place for us where we have spent many happy family holidays. We also want your holiday to be a happy and special occasion – one that you will treasure for years to come. We have put a lot of time + effort into making Dragon Cottage Tenby a comfortable self catering holiday cottage + we are constantly looking to improve on what is already a first class holiday home. We are confident that you will find at the Cottage all that you need for making your stay an enjoyable one. Our prices are very competitive when compared with similar properties in the area. Should you have any queries please do not hestitate to get in touch. Dragon Cottage was already an established self catering holiday accommodation when we bought the property in 2003. At that time it was a Welsh Tourist Board 3 star property but now following many improvements and upgrades it is a high 4 star property. Having been on many self catering holidays in the past, it was always a dream of ours to run our own self catering property. We have always loved Tenby with it's fantastic scenery and beautiful clean beaches, and when Dragon Cottage was put on the market in 2003 we decided to purchase it with the aim of turning it into a dream holiday home. The Tenby area has many lovely holiday cottages but what makes Dragon Cottage really special is it's very central location. Not only is the cottage beautifully furnished and well equipped it is also within a few minutes walk to all that Tenby has to offer, including the beach, town centre, supermarket, golf course, pubs, restaurants and many other amenities. Many of our guests hardly use the car all week, so convenient is Dragon Cottage to everything in Tenby. On the other hand, should you wish to visit some of the fantastic theme parks and attractions within the county of Pembrokeshire you will again find that these destinations are only a short car journey away. It is no exaggeration to say that Dragon Cottage is truly an ideal holiday destination. Bathroom 1 is downstairs with with bath; bath shower; separate shower unit; toilet; wash basin; shaver point. Bathroom 2 is upstairs with free standing roll top, claw footed bath; toilet; wash hand basin; shaver point. Dragon Cottage is ideally located being within easy walking distance to the beach. Dragon Cottage is within easy walking distance to the town centre with it's many shops, pubs and restaurants. A weekly parking permit is available for guests at a very reasonable price. We will provide you with the relevant application form. Towels are provided on request for a small extra charge. Satellite Freeview 32" TV / DVD Player Central Heating Two 3 seater comfy sofas Tub chair Window seat running the length of the room. Tenby golf club: Located only a short distance from Dragon Cottage, Tenby Golf Club offers stunning views of the sea and the island of Caldey. It has been ranked in the top five courses for golf holidays within Wales. I can highly recommend Dragon Cottage and Tenby during the winter months. The cottage is perfectly located for the town and the beach. It is well equipped and nice and warm. The landlords are very friendly and helpful people. My four month stay was just perfect. We are so pleased you enjoyed your stay. We must return the compliment and say that you were a perfect guest. Thank you. lots of space in cottage, lovely outside garden and dining area and great location. Thank you for taking the time to review our property. Amongst other things the location sold this property to us when we bought it. So glad you agree. We spent a week at Dragon Cottage, which was very comfortable, well equipped and spotlessly clean. The cottage is in a quiet street, but just a short stroll to the centre of town and the lovely bays along the seafront. There a Sainsbury’s just a short walk away, which is very useful and a it has a good range. We can thoroughly recommend Dragon Cottage to anyonewanting to stay in Tenby. We an recommend the Bay Tree for excellent meals. We didn't discover it until two days before we left! The castles of Pembroke and Minorbia are worth a visit as is St Davids Cathedral (although a bit of a drive). However, if you are a family and the weather is good, you don’t need to go anywhere except Tenby - the kids will love it! We are so pleased you enjoyed your stay. We look forward to welcoming you back to Dragon Cottage in the future. So glad that you enjoyed your visits to Dragon Cottage and that the close proximity to beach, harbour and other amenities helped to make your stay a pleasant experience. We look forward to welcoming you back. Chose this cottage online. What a winner!! We stayed there with family from England. It was fantastic. The location of the cottage was perfect because once you parked you could walk to anywhere in the lovely town of Tenby. We had all the mod coms one needs in a house plus charm. Even the English relatives, who had never been to Wales before, and went reluctantly. admitted that they would definitely go again and book The Dragon Cottage!!! Having travelled all the way from Canada to Wales we are so glad that you have enjoyed your stay at Dragon Cottage. Glad also that your relatives from England had a good first experience of Wales. We would be glad to welcome you back any time. We were a party of 4 adults & an 18 month old baby, Dragon cottage was easy to find from the directions, it was as advertised close to the town and beaches, the cottage was in a quiet residential road, the cottage on arrival was very clean & equipped with various essential items, a large number of shops, pubs, cafes & restaurants were within easy walking distance, the cottage is a typical Welsh cottage with bathrooms both upstairs and down, I would not hesitate to book this cottage again and would recommend to friends & family. Thank you for your review. We are glad that you enjoyed your stay and look forward to welcoming you back in the future. Tenby is one of Wales' premier holiday resorts, famous for its beautiful sandy beaches, clean seas and stunning scenery. Situated on Pembrokeshire's south coast it is a mere two hours drive from the Severn Bridge. From the picturesque harbour at Tenby there are organised daily boat trips, including fishing expeditions and visits to the famous Caldey Island and its Cistertian Monks. The town is approximately two minutes walk from the Cottage. There is a grocery shop very conveniently placed, just a few yards up the road, and round the corner in the next street there is an excellent Fish and Chip shop which provides both take away and sit down meals. A few yards from the from the Fish and Chip shop is the main supermarket. Tenby's facilities cater for all ages and Dragon Cottage is ideally located to be within easy walking distance to all that the town has to offer. It is also only a short drive to Pembrokeshire's many attractions and theme parks. The superb location of Dragon Cottage means that the sea front is only 2 - 3 minutes walking distance. Being so close to the beach takes away all the hassle of parking. The sea around Tenby is safe for bathing and the beaches regularly receive the prestigious blue flag award. Regular boat trips are organised for fishing, sight seeing or visiting Caldey Island. The latter is a very special attraction where Cistercian monks continue a traditional lifestyle which began there in Celtic times. By car, access from the east is normally along the M4 till you reach its end. Then join the A48 through to Carmarthen + then onto the A40 all the way to St Clears. From the roundabout just past St Clears, follow the A477 through until you reach the roundabout where the A478 turning is signposted to Tenby. Follow the signs to Tenby Town Centre. From the North of Wales, you can take the A487 Cardigan Bay Coast Road south until you reach Cardigan where the A478 is a left turn which leads to Tenby. 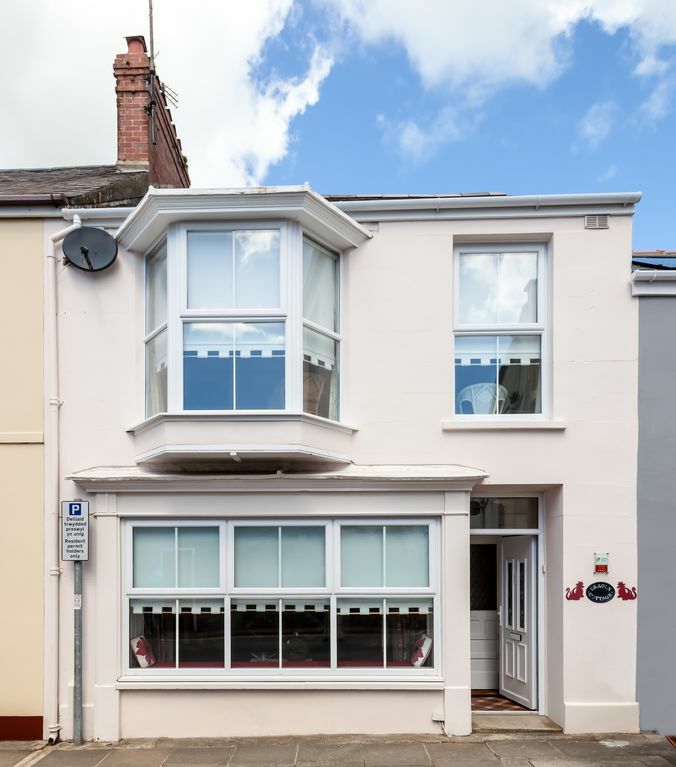 Dragon Cottage is ideally placed in a quiet street in the heart of Tenby. The town itself is one of Wales’ premier holiday destinations and is easily accessible by bus, train and car. (A British Rail Station is situated in Tenby). Travelling distance from the Severn Bridge is around 2 hours.